The number of children being raised without a father or mother has hit epic proportions the world over. The physical and emotional consequences of this are staggering; the spiritual ramifications, devastating. Billy Wilson, pastor and TV host, knows that believers are uniquely equipped to help these young people, to bring them healing and ultimate reconciliation. 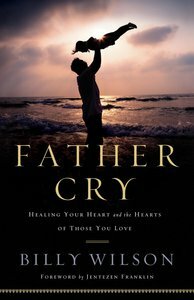 Through sharing his own story of abandonment and wounding, Wilson shows that when this desperate cry for a father meets the cry of the Father, blessings and revival will be unleashed into all generations. With biblical examples and keen insight, he reveals how older and younger generations can come together, reclaim what was lost, and turn the pain of parental wounding into a place of supernatural intimacy and ministry to others. Billy Wilson, executive director of the International Center for Spiritual Renewal and host of World Impact with Billy Wilson, has more than 32 years of ministry experience. In that time he has served in many roles and personally ministered in over 80 nations. The author of numerous articles, sermon series, video projects and books, Wilson has served as an influential leader in Spirit-empowered organizations, including Azusa Street Centennial, Oral Roberts University, Empowered21, and more. He and his wife, Lisa, live in Cleveland, Tennessee.